Apartments are situated at the island Ciovo, which is connected with land by bridge – in Trogir. 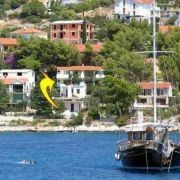 House is in the … More » resort Okrug Gornji – Mavacnicna, at the southern side of island. We offer home vine and rakija. 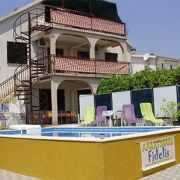 We have 4 fully equipped apartments for 2,3,4,5 and 6 persons. Swimming pool. Apartments in the house on the island ČIOVO in OKRUG GORNJI (MAVARŠTICA), 2nd row from the sea. All apartments … More » have 5 beds with their own entrance, balconies, terrace, AC, TV/SAT, internet, parking, sea view. The price is negotiated with the host and depends on the season and number of guests. 4 and 5-bed apartments in family house on the south side of Ciovo Island, which is connected by new bridge to the … More » mainland. The apartments are air-conditioned and equipped with kitchenware and bedlinen. 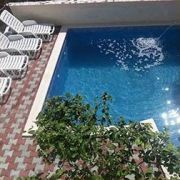 Guests can use swimming pool and spacious parking. The beach 150m, shop and cafe 50m. Trogir 5km.